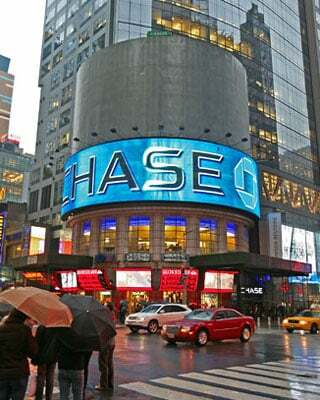 New York’s Times Square is going eco-friendly, sort of. A giant billboard powered by solar and wind energy is to be installed at the city’s famous landmark. The curved billboard is equipped with 16 wind turbines and 64 solar panels, the New York Times has reported. It’ll be leased by printer and camera manufacturer Ricoh for the first three months. 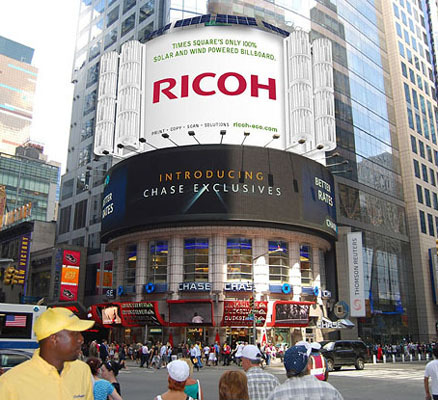 Although the 126 x 47ft eco-billboard cost around $3m (£2m/€2.3m) to create, Ricoh’s estimated that the sign will save enough electricity to light six homes for 12 months. It will prevent roughly 18 tons of carbon dioxide from being pumped into the city’s air each year. Ricoh’s sign will also be aided by 16 300W floodlights, which sort of defeats the object, doesn’t it? The billboard will be switched on at a lighting ceremony on 4 December.